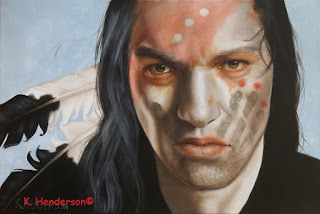 This painting shows a Plains Indian with a black hand (coup mark) painted on his face. This is a sign of Bravery. To be first to touch the enemy was regarded as the bravest deed of all, it was even a point of bravado for a single warrior to rush in among the enemy and strike one with quirt, coup stick or gun before attempting to fire, thus risking his own life.